Folates accept one-carbon units from donor molecules and passes them on via various biosynthetic reactions (1). In their reduced form cellular folates function conjugated to a polyglutamate chain. These folates are a mixture of unsubstituted polyglutamyl tetrahydrofolates and various substituted one-carbon forms of tetrahydrofolate (e.g., 10-formyl, 5,10-methylene, and 5-methyl) (Figure 6). The reduced forms of the vitamin, particularly the unsubstituted dihydro and tetrahydro forms, are unstable chemically. They are easily split between the C-9 and N-10 bond to yield a substituted pteridine and p-aminobenzoylglutamate, which have no biologic activity (2). Substituting a carbon group at N-5 or N-10 decreases the tendency of the molecule to split; however, the substituted forms are also susceptible to oxidative chemical rearrangements and, consequently, loss of activity (2). The folates found in food consist of a mixture of reduced folate polyglutamates. Although natural folates rapidly lose activity in foods over periods of days or weeks, folic acid (e.g., in fortified foods) is almost completely stable for months or even years. The chemical lability of all naturally occurring folates results in a significant loss of biochemical activity during harvesting, storage, processing, and preparation. Half or even three-quarters of initial folate activity may be lost during these processes. This is in contrast to the stability of the synthetic form of this vitamin, folic acid (2). In this form the pteridine (2-amino-4-hydroxypteridine) ring is not reduced (Figure 6), rendering it very resistant to chemical oxidation. However, folic acid is reduced in cells by the enzyme dihydrofolate reductase to the di- and tetrahydro forms (Figure 7). This takes place within the intestinal mucosal cells, and 5-methyltetrahydrofolate is released into the plasma. The bio-availability of natural folates is affected by the removal of the polyglutamate chain by the intestinal conjugase. This process is apparently not complete (4), thereby reducing the bio-availability of natural folates by as much as 25-50 percent. In contrast, synthetic folic acid appears to have a bio-availability of close to 100 percent (4, 5). The low bio-availability and - more importantly - the poor chemical stability of the natural folates has a profound influence on the development of nutrient recommendations. This is particularly true if some of the dietary intake is in the synthetic form, folic acid, which is much more stable and bio-available. Food fortification of breakfast cereals, flour, etc. can add significant amounts of folic acid to the diet. Functional folates have one-carbon groups derived from several metabolic precursors (e.g., serine, N-formino-L-glutamate, folate, etc.). With 10-formyltetrahydrofolate the formyl group is incorporated sequentially into C-2 and C-8 of the purine ring during its biosynthesis. Likewise the conversion of deoxyuridylate (a precursor to RNA) into thymidylate (a precursor to DNA) is catalysed by thymidylate synthase, which requires 5,10-methylenetetrahydrofofate. Thus, folate in its reduced and polyglutamylated forms is essential for the DNA biosynthesis cycle shown in Figure 6. Figure 6. The chemical formula of folic acid (synthetic form) and the most important natural folates. Note: In cells and thus in food the latter are conjugated to a polyglutamate tail. Figure 7. The role of the co-fractors in the DNA cycle and the methylation cycle. The enzyme methionine synthase requires vitamin B12 as well as folate for activity. 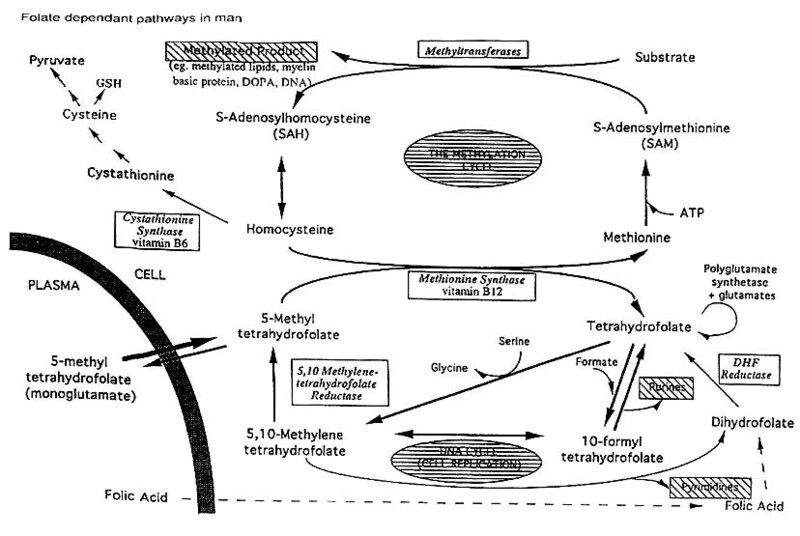 Alternatively 5,10-methylenetetrahydrofolate can be channelled to the methylation cycle (1). This cycle has two functions. It ensures that the cell always has an adequate supply of S-adenosylmethionine, an activated form of methionine, which acts as a methyl donor to a wide range of methyltransferases. These enzymes methylate a wide range of substrates including lipids, hormones, DNA, proteins, etc. One such important methylation is that of myelin basic protein, which acts as insulation for nerves cells. When the methylation cycle is interrupted as it is during vitamin B12 deficiency, one of the clinical consequences is the demyelination of nerve resulting in a neuropathy which leads to ataxia, paralysis, and, if untreated, ultimately death. Other important methyltransferase enzymes down-regulate DNA and suppress cell division (1). In the liver the methylation cycle also serves to degrade methionine. Methionine is an essential amino acid in Humans and is present in the diet of people in developed countries at about 60 percent over that required for protein synthesis and other uses. The excess methionine is degraded via the methylation cycle to homo-cysteine, which can either be catabolised to sulfate and pyruvate (with the latter being used for energy) or remethylated to methionine. The need to maintain intracellular S-adenosylmethionine levels is related to the amount of methionine metabolised via homo-cysteine. The DNA and methylation cycles both regenerate tetrahydrofolate. However, there is a considerable amount of catabolism of folate (6) and a small loss of folate via excretion from the urine, skin, and bile. There is a need to replenish the bodys folate content by uptake from the diet. If there is inadequate dietary folate, the activity of both the DNA and the methylation cycles will be reduced. A decrease in the former will reduce DNA biosynthesis and thereby reduce cell division. Although this will be seen in all dividing cells, the deficiency will be most obvious in cells that are rapidly dividing, for example, in a decrease in red cell production, producing anaemia. Other cells derived from bone marrow also decrease, leading to leucopenia and thrombocytopenia. Likewise there is a reduction in cell division in the lining of the gut. Taken together, this reduction in the DNA cycle results in an increased susceptibility to infection, a decrease in blood coagulation, and secondary malabsorption. In folate deficiency, the flux through the methylation cycle is decreased but the DNA cycle may be more sensitive. The most obvious expression of the decrease in the methylation cycle is an elevation in plasma homo-cysteine. This is due to a decreased availability of new methyl groups provided as 5-methyltetrahydrofolate, necessary for the remethylation of plasma homo-cysteine. Previously it was believed that a rise in plasma homo-cysteine was nothing more than a biochemical marker of possible folate deficiency. However, there is increasing evidence that elevations in plasma homo-cysteine are implicated in the aetiology of cardiovascular disease (7). This moderate elevation of plasma homo-cysteine occurs in subjects with a folate status previously considered adequate (8). Interruption of the methylation cycle resulting from impaired folate status or deceased vitamin B12 or vitamin B6 status may have serious long-term risks. Such interruption, as seen in vitamin B12 deficiency (e.g., pernicious anaemia), causes a very characteristic demyelination and neuropathy known as subacute combined degeneration of the spinal cord and peripheral nerves. If untreated, this leads to ataxia, paralysis, and ultimately death. Such neuropathy is not usually associated with folate deficiency but is seen if folate deficiency is very severe and prolonged (9). The explanation may lie in the well-established ability of nerve tissue to concentrate folate to a level of about five times that in the plasma. This may ensure that nerve tissue has an adequate level of folate when folate being provided to the rapidly dividing cells of the marrow has been severely compromised for a prolonged period. The resultant anaemia will thus inevitably present clinically earlier than the neuropathy. Nutritional deficiency of folate is common in people consuming a limited diet (10). This can be exacerbated by malabsorption conditions, including coeliac disease and tropical sprue. Pregnant women are at risk of folate deficiency because pregnancy significantly increases the folate requirement, especially during periods of rapid foetal growth (i.e., in the second and third trimester) (6). During lactation losses of folate in milk also increase the folate requirement. During pregnancy there is an increased risk of foetal neural tube defects (NTDs), with risk increasing 10-fold as folate status goes from adequate to poor (11). Between days 21 and 27 post-conception, the neural plate closes to form what will eventually be the spinal cord and cranium. Spina bifida, anencephaly, and other similar conditions are collectively called NTDs. They result from improper closure of the spinal cord and cranium, respectively, and are the most common congenital abnormalities (12). Although folate is found in a wide variety of foods, it is present in a relatively low density (10) except in liver. Diets that contain adequate amounts of fresh green vegetables (i.e., in excess of three servings per day) will be good folate sources. Folate losses during harvesting, storage, distribution, and cooking can be considerable. Likewise, folate derived from animal products is subject to loss during cooking. Some staples, such as white rice and unfortified corn, are low in folate (see Chapter 2). In view of the increased requirement for folate during pregnancy and lactation and by select population groups and in view of its low bio-availability, it may be necessary to consider fortification of foods or selected supplementation of women of child-bearing years. The 1988 Food and Agriculture Organization of the United Nations and World Health Organization (FAO/WHO) Expert Consultation report (13) indicated that there were three states of folate nutrition: folate adequacy, impending folate deficiency, and overt folate deficiency. This represented the thinking at the time with respect to folate status - that a status necessary to prevent clinical deficiency was clearly present with folate adequacy and that further improvement in folate status would have no benefit. It would thus be appropriate to increase intake in those with impending folate deficiency or more importantly in those with overt folate deficiency but that nothing was to be gained by increasing the status of those who had adequate status. In the 1988 FAO/WHO report (13) it was suggested that adequate folate status is reflected in a red cell folate level of greater than 150 mg/L. Of less relevance was a liver folate level of greater than 7.5 mg/g, because such values are only available in rare circumstances. A normal N-formino-L-glutamate test was also cited as evidence of sufficiency, but this test has largely been discredited and abandoned as not having any useful function (10). In more recent literature red cell folate continues to be used as an important index of folate status (14). Plasma folate is also used but is subject to greater fluctuation. Indicators of haematologic status such as raised mean corpuscular volume, hypersegmentation of neutrophils, and, eventually, the first stages of anaemia remain important indicators of reduced folate status (15). The biomarker plasma homo-cysteine is a very sensitive indicator of folate status and must be added to the indicators of folate adequacy. This applies not only to the deficient range of red blood cell folate but includes normal and even above-normal levels of red cell folate (14). There is also very strong evidence that plasma homo-cysteine is an independent risk factor for cardiovascular disease (8, 16). Any elevation in homo-cysteine, even at levels where overt folate deficiency is not an issue, may be undesirable because it is a risk factor for chronic disease. Thus, newer thinking would require consideration of a folate intake that would reduce plasma homo-cysteine to a minimum level of less than 7.0 mmol/l. Formerly acceptable levels of red cell folate may therefore be associated with an increased rise of cardiovascular disease and stroke (17,18). The possible benefit of lowering plasma homo-cysteine through increased folate intake can be proven only by an intervention trial with folic acid supplementation in large populations. Using plasma homo-cysteine as a biomarker for folate adequacy can only be done on an individual basis after the possibility of a genetic mutation or an inadequate supply of vitamin B6 or vitamin B12 has been eliminated. There is now conclusive evidence that most NTDs can be prevented by the ingestion of folic acid near the time of conception (11,12). Lower red cell folate, including what was previously considered an adequate or normal range, is associated with an increased risk of spina bifida and other NTDs (19). Red cell folate levels greater than 150 µg/L, which are completely adequate to prevent anaemia, are associated with increase risk of NTDs (11). Low folate status, including red cell levels in the normal range, increases the risk of colorectal cancer (20, 21). In 1998, the US National Academy of Sciences (22) exhaustively reviewed the evidence of folate intake, status, and health for all age groups and also reviewed the literature on the extra requirements during pregnancy and lactation. This review led to calculations of an estimated average requirement (EAR) and a subsequent estimation of the recommended dietary allowances (RDAs) to be the EAR plus 2 standard deviations. This definition of the RDA agrees with the definition of the FAO/WHO recommended nutrient intake (RNI), and members of this FAO/WHO expert group agreed that the values published by the US National Academy of Sciences were the best estimates of folate requirements based on the current literature. Therefore, the FAO/WHO expert group adopted the same approach, and the RNIs suggested in Table 13 were based on the RDAs of the US National Academy of Sciences. These recommendations apply to healthy individuals and populations. Adapted from the US National Academy of Sciences (22). a Based on a human milk intake of 0.75 l/day. The RNIs suggested for groups in Table 13 used food folate as the source of dietary folate because most societies in developing countries consume folate from naturally occurring sources. As discussed in the introduction, natural folates are found in a conjugated form in food, which reduces its bio-availability by perhaps as much as 50 percent (4). In addition, natural folates are much less stable. If chemically pure folic acid (pteroyl monoglutamate) is used to provide part of the RNI, by way of fortification or supplementation, the total dietary folate, which contains conjugated forms (pteroyl polyglutamates), could be reduced by an appropriate amount. On average the conjugated folate in natural foods is considered to be only half as available as synthetic folic acid. For example, the recommendation of usual mixed forms of folate in the diet is 400 µg/day, but 100 µg of this given as pure folic acid would be considered to be equivalent to 200 µg of dietary mixed folate. Hence, only an additional 200 µg of dietary folate would be needed. To be comparable to food folate, only half as much folic acid is needed if taken on an empty stomach, i.e., 1 µg of DFE = 1 µg of food folate = 0.5 µg of folic acid taken on an empty stomach = 0.6 µg of folic acid with meals (22). The experts from the National Academy of Sciences went on to say that the required estimates for the dietary folate equivalents could be lowered if future research indicates that food folate is more than 50 percent bio-available. It is now agreed that a supplement of 400 µg of folic acid taken near the time of conception will prevent most neural tube defects (NTDs) (23, 24). The recommendation to prevent recurrence in women with a previous NTD birth remains 4.0 mg/day because of the high increase in risk in such cases and because that was the amount used in the most definitive trial (25). Because of the poorer bio-availability and stability of food folate, a diet based on food folate will not be optimum in prevention. One study determined that risk of NTD is 10-fold higher in people with poor folate status than in those with high normal folate status (11). A further study suggests that an extra 200 mg/day or possibly 100 µg/day if taken habitually in fortified food would prevent most if not all of folate-preventable NTDs (26). Ideally, an extra 400 µg/day should be provided because this is the amount used in various intervention trials (12) and can be achieved by supplementation. This amount could not be introduced by way of fortification, because exposure to high intakes of folic acid by people consuming a large intake of flour would run the risk of preventing the diagnosis of pernicious anaemia in the elderly. It is likely that depending on the staple chosen it would be possible to increase intake in most women by 100 µg/day without causing too high an exposure in other groups. It is suggested that this amount, although not optimal, will prevent most NTDs. Plasma homo-cysteine concentration, if only moderately elevated, is an independent risk factor for cardiovascular disease (7, 8, 16) and stroke (18). Increased risk was associated with values higher than 11 mmol/l (8), which is well within what is the normal range (5-15 mmol/l) of plasma homo-cysteine levels (27). In addition, even in populations that are apparently normal and consuming diets adequate in folate, there is a range of elevation of plasma homo-cysteine (14) that could be lowered by an extra 100 or 200 µg/day of folic acid (8, 27). Large-scale intervention trials regarding the significance of interrelationships among folate levels, plasma homo-cysteine levels, and cardiovascular disease have not been completed and therefore it would be premature to introduce public health measures in this area. Evidence suggests a link between colorectal cancer and dietary folate intake and folate status (20, 21). One study reported that women who take multivitamin supplements containing folic acid for prolonged periods have a significantly reduced risk of colorectal cancer (28). However, the scientific evidence is not sufficiently clear for recommending increased folate intake in populations at risk for colorectal cancer. There is no evidence that it is possible to consume sufficient natural folate to pose a risk of toxicity (22). However, this clearly does not apply to folic acid given in supplements or fortified foods. The main concern is the masking of the diagnosis of pernicious anaemia, because high levels of folic acid correct the anaemia, allowing the neuropathy to progress undiagnosed to where it may become irreversible even upon treatment with vitamin B12 (1, 29). Consumption of large amounts of folic acid might also pose other less well-defined risks. Certainly, consumption of milligram amounts of folic acid would be undesirable. Savage and Lindenbaum (30) suggest that even at levels of the RNI there is a decreased opportunity to diagnose pernicious anaemia through its presentation via the anaemia. The US National Academy of Sciences (22), after reviewing literature, has suggested an upper level of 1000 µg. Thus, 400 µg/day of folic acid, in addition to dietary folate, would seem safe. There is probably no great risk of toxicity at a range between 400 and 1000 µg of folic acid per day with the exception of some increased difficulty in diagnosing pernicious anaemia resulting from the masking of the anaemia. Folate status may be related to birth weight. Therefore it is important to study the relationship between folate status and birth weight, especially in populations where low birth weight is prevalent. Folate status probably differs widely in different developing countries. Red cell folate levels are an excellent determinant of status. Such estimates in representative populations would determine whether some communities are at risk from poor folate status. Some evidence indicates that elevated plasma homo-cysteine is a risk factor for cardiovascular disease and stroke. Elevated plasma homo-cysteine is largely related to poor folate status, with poor vitamin B6 status, poor vitamin B12 status, or both also contributing. There are also genetic differences (31). The prevalence of elevated plasma homo-cysteine and its relationship to cardiovascular disease should be established in different developing countries. More data should be generated on the bio-availability of natural folate from diets consumed in developing countries. Because the absorption of folate may be more efficient in humans with folate deficiency, folate absorption in these populations requires additional research. The relationship between folate deficiency and the incidence of NTDs in developing countries needs further investigation. Quantitation of the folate content of foods typically consumed in developing countries should be established for the different regions of the world. 1. Scott, J.M. & Weir, D.G. 1994. Folate/vitamin B12 interrelationships. Essays in Biochemistry, 28: 63-72. 2. Blakley, R. 1969. The biochemistry of folic acid and related pteridines. North Holland Research Monographs Frontiers of Biology. Vol. 13, Editors H. Newbergen and E.L. Taton. Amsterdam. North Holland Publishing Company. 3. Kelly, P., McPartlin, J., Goggins, S., Weir, D.G. & Scott J.M. 1997. Unmetabolised folic acid in serum: acute studies in subjects consuming fortified food and supplements. Amer. J. Clin Nut., 69:1790-1795. 4. Gregory, J.F. 1997. Bio-availability of folate. Eur. J. Clin. Nutr., 51: 554-559. 5. Cuskelly, C.J., McNulty, H. & Scott, J.M. 1996. Effect of increasing dietary folate on red-cell folate: implications for prevention of neural tube defects. Lancet, 347:657-659. 6. McPartlin, J., Halligan, A., Scott, J.M., Darling, M. & Weir, D.G. 1993 Accelerated folate breakdown in pregnancy. Lancet, 341:148-149. 7. Scott, J.M. & Weir , D.G. 1996. Homo-cysteine and cardiovascular disease. Q. J. Med., 89: 561-563. 8. Wald, N.J., Watt, H.C., Law, M.R., Weir, D.G., McPartlin, J. & Scott, J.M. 1998. Homo-cysteine and ischaemic heart disease: results of a prospective study with implications on prevention. Arch. Internal Med., 158: 862-867. 9. Manzoor, M. & Runcie J. 1976. Folate-responsive neuropathy: report of 10 cases. BMJ, 1: 1176-1178. 10. Chanarin, I. 1979. The Megaloblastic Anaemias 2nd Edition Blackwell Scientific Publications Oxford. 11. Daly, L.E., Kirke, P.M., Molloy, A., Weir, D.G. & Scott, J.M. 1995. Folate levels and neural tube defects. Implications for prevention. JAMA, 274: 1698-1702. 12. Scott, J.M., Kirke, P., Molloy, A.M., Daly, L. & Weir, D. 1994. The role of folate in the prevention of neural tube defects Proc. Nutr. Soc., 53: 631-636. 13. FAO/WHO. FAO/WHO Expert Consultation. 1988. Requirements of Vitamin A, Iron, Folate and Vitamin B12. p. 51-61. Rome, FAO. 14. Sauberlich, H. 1995. Folate status in the US Population groups. Folate in Health and Disease. Lynn Bailey editor p. 171-194 Marcel Dekker, New York. 15. Lindenbaum, J., Savage, D.G., Stabler S.P. & Allen, R.H. 1990. Diagnosis of cobalamin deficiency : II. Relative sensitivities of serum cobalamin, methylmalonic acid, and total homo-cysteine concentrations. Am. J. Haematol., 34: 99-107. 16. Boushey, C.J. Beresford S.A., Omenn, G.S. & Motulsky A.G. 1995. A quantitative assessment of plasma homo-cysteine as a risk factor for vascular disease. JAMA, 274: 1049-1057. 17. Selhub, J., Jacques, P.F., Wilson, P.W.F., Rush, D. & Rosenberg, I.H. 1993. Vitamin status and intake as primary determinants of homo-cysteinemia in an elderly population. JAMA, 270: 2693-2698. 18. Perry, I.J., Refsum, H., Morrise, R.W., Ebrahim, S.B., Ueland, P.M. & Shaper, A.C. 1995. Prospective study of serum total homo-cysteine concentrations and risk of stroke in a middle aged British men. Lancet, 346: 1395-1398. 19. Kirke, P.M., Molloy, A.M., Daly, L.E., Burke, H., Weir, D.G. & Scott, J.M. 1993. Maternal plasma folate and vitamin B12 are independent risk factors for neural tube defects. Q. J. Med., 86: 703-708. 21. Kim, Y.I., Fowaz, K., Knox, T., Lee, Y., Norton, R., Arora, S. Paiva, L. & Mason, J.B. 1998. Colonic mucosal concentrations of folate correlate well with blood measurements of folate in persons with colorectal polyps. Am. J. Clin. Nutr., 68: 866-872. 22. National Academy of Sciences. 1998. Dietary Reference Intakes: Folate, other B Vitamins and Choline. Wasington, D.C., National Academy Press. 23. UK Dept of Health. 1992. Folic Acid and the Prevention of Neural Tube Defects. Report from an Expert Advisory Group. H.M. Stationary Office. 24. Centers for Disease Control. 1992. Recommendations for the use of folic acid to reduce the number of cases of spina bifida and other neural tube defects. MMWR, 41: 1-7.(No. RR-14). 25. MRC Vitamin Study Research Group. 1991. Prevention of neural tube defects: results of the Medical Research Council Vitamin Study. Lancet, 338: 131-137. 26. Daly, S., Mills J.L, Molloy, A.M., Conley, M.L., Lee, Y.J., Kirke, P.N., Weir, D.G. & Scott, J.M. 1997. Minimum effective dose of folic acid for food fortification to prevent neural tube defects. Lancet 350: 1666-1669. 27. Refsum, H., Ueland, P.M., Bygard, M.D. & Vollset, S.E. 1998. Homo-cysteine and Cardiovascular Disease. Annu. Rev. Med., 49: 31-62. 28. Giovannucci E., Stampfer M.J., Colditz G.A., Hunter D.J., Fuchs C., Rosen B.A., Speitzer F.F. & Willett W.C. 1998. Multivitamin use, folate and colorectal cancer in women in the Nurses Health Study. Ann. Internal Med., 129: 517-524. 29. Weir Donald G. & Scott John M. 1999. Vitamin B12 Cobalamin In: Modern Nutrition in Health and Disease, editors: Maurice A.Shils, James A.Olson, Moshe Shike,A, Catharine Ross. Ninth Edition, p. 477-458. Philadelphia, Lippincott Williams and Wilkins. 30. Savage, D.G. & Lindenbaum, J. 1995 Neurological complications of acquired cobalamin deficiency : clinical aspects. In: Baillieres Clin Haematol. Megaloblastic Anaemia Editor S.M. Wickramasinghe vol. 8, p. 657-678. London, Bailliere Tindall. 31. Whitehead, A.S., Gallagher. P., Mills J.L., Kirke P., Burke H., Molloy A.M., Weir, D.G., Shields, D.C. & Scott J.M. 1995 A generic defect in 5, 10 methylenetetrahydrofolate reductase in neural tube defects. Q. J. Med., 88: 763-766.